People get water for 8 months but this water is not safe for drinking purpose. Rest of the period people have to walk a distance of 1 to 1.5 km from the hill top to the valley to collect the water. Presently the school children have no access to drinking water. Since the village is situated on the hill top, there is an enormous scarcity of water and the children have to travel to a distance of aprox. 1000 ft to get water. After the implementation of the project a provision of a stand post will be made and the school can access water from it. A total of 87 students (girls 48, boys 39) will get benefit from this activity. About 40% of the total population have access to sanitation facilities. This information has been collected through discussion with the villagers. This village has been selected for the watershed development programme in the year 2004 by WOTR. Presently the project is in the capacity building phase. The process of community organisation and social mobilisation as well as the technical aspects of the watershed is under process. Considering the above problem the women members of the SHGs and SMS have taken the initiative to solve this problem with the help of the Village Development Committee and the Gram-Panchayat. There are total 6 SHGs involving 92 members. The SMS and Village Development Committee (VDC) have prepared the plan and estimate of the proposed drinking water project from the engineering dept. of Sangammner sugar factory. The women and village community have identified a permanent source of water in the valley, near to the natural water-fall at distance of (510 mtrs) 1700 ft in the field belonging to Shri Namdev Sakharam Chaudary. He has donated 1000 sq. 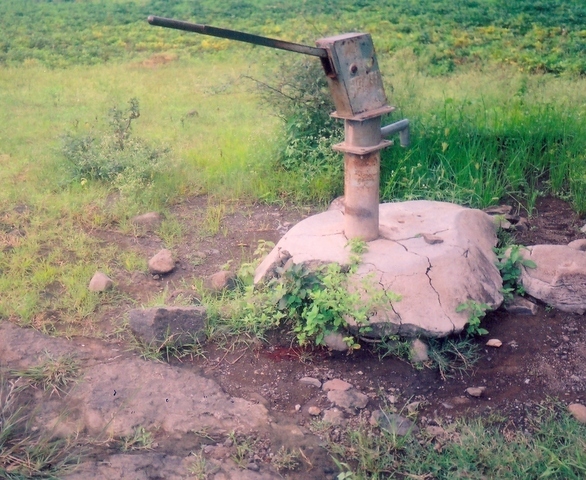 ft plot of the well to Gram-Panchayat for the implementation of drinking water project. It is planned that a new well will be excavated at this spot and the water will be lifted and transported through galvanized pipes (since the height is too much) and stored at the already constructed over head storage tank. The water will be supplied through stand posts. The gram-panchayat has given no objection letter to this effect. The people are ready to contribute 15% of the total cost by way of voluntary free labour. They have submitted all the required documents to WOTR. The project will be implemented in one phase and the amount will be released in 3/4 installments. After the monitoring of the utilisation of the first installment the next installment and so on will be released. -General Body Village meetings were held several times with the villagers to discuss the problems and immediate needs of the village. -A Participatory Rural Appraisal (PRA) was conducted to determine the available infrastructure, resources and the social locations of the households. -Organisation of women has been done by involving them into Self Help Groups. These groups were federated under the Apex Body of all SHGS which is called the Samyukta Mahila Samitee (SMS). -The SHGs and the SMS have taken the initiative to solve the drinking water problem. The designing and the initial planning has been done with the help of Village Development Committee and with the support of Gram Panchayat (local elected village body). -The plan has been technically approved with some minor modifications by WOTR's technical engineers. -All the households have agreed to contribute 15% of the total cost of the project Before the initiation of the activity, a separate Water Committee (Pani Samitee) of the women will be formed. The Water Committee and the SMS will be responsible for the implementation, supervision, quality control and monitoring of the activity which they have willing accepted to do. -The project funds will be deposited directly in the Water Committee's bank account. The Committee will handle all the transactions and will be responsible for the accounts. -Two trainings will be conducted for the SMS and the Water Committee regarding the safe drinking water, health, hygiene and sustenance of the project after completion. -After completion of the activity, a water tax will be collected from each household as per Maintenance Revenue Model attached. We congratulate you on a well-thought out, small-scale project serving 114 families. Requiring the community to pay for water provision is commendable as it encourages ownership of the project and sustainability of the service. One question remains regarding revenue generation: 100 of the 114 families will be contributing 40 Rupees per month. What distinguishes the remaining 14 families from the others and what are these families contributing, if not cash? How has the rest of the community responded to this difference in revenue contribution? Thank you for your appreciation and feedback. -Reg. the revenue generation; out of 114 families 100 families are expected to contribute Rs. 40/- ($0.89) per month/family towards the maintenance as well as reserve fund. -The remaining 14 families are considered very poor families such as single parent, widows, destitute etc in the village. All the families in the village are not practically in position to pay the water charges hence it is envisaged that 10-12 % families will have to be exempted from paying the water charges. Hence while factoring the contribution this was taken into account. -Before making the proposal this issue has been discussed in the meeting and the villagers have given their consent to the same. -Once the project is initiated the final decision will be taken by the villagers in the village body meeting (gram sabha) that who should be exempted from paying the water charges. We were interested in knowing in how many villages has such a project been implemented before? Has the monthly water tax system worked in those places? If water can be given on stand posts, with a little incremental costs (and massive incremental benefits), surely piped water supply to the homes is possible too...? What about sanitation? Unhygenic sanitary practices by 60% of the families will not leave any local water source uncontaminated. Why not also attempt total sanitation? 1. So far we have completed 5 drinking water projects under BPR out of which 3 have been completed and 2 are nearing completion. In these 3 completed projects, after the completion of the activity it has been handed over to the Gram Panchyat for the operation as well as for the maintenance. The water tax is being collected by the Gram Panchayat on a yearly basis for which the SMS and Water Committee assists them to collect the water charges. After the experience gained through the implementation of these projects, we realized that after completion of the project the people should manage and run the project by themselves. Therefore, we have developed a new model of the revenue cost in which the village community should agree from the beginning that they will have to pay fixed charges per annum. Very often it is difficult to pay the entire amount at once; hence they should know what the monthly charges are. It is decision of the people whether to collect on a monthly or quarterly basis. But regarding the two projects we have insisted the people that they should collect at least one years maintenance cost before the initiation of the project. Both the villages have already collected the water charges in advance. 2. Yes, we do agree with your opinion. From above ongoing two projects in one village all the families have taken independent tap connections (160 connections) to their homes with their own cost. But in another village it is not possible, as the houses are scattered and most of the people live in their fields. Wherever possible, the tap connection can be given to individual houses. 3. 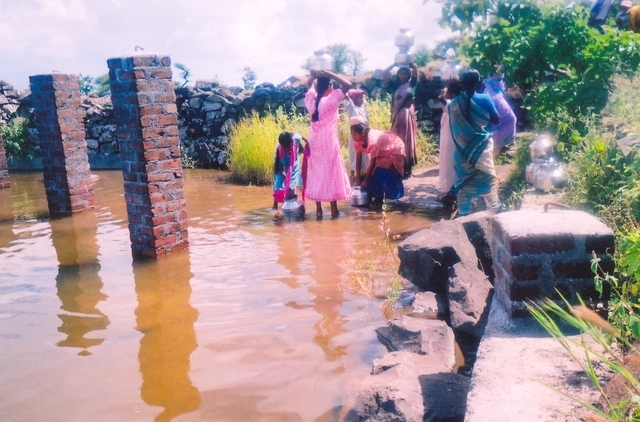 In the initial stage, we have focused to provide the safe drinking water to the community. We are in process of planning sanitation in the village on a larger scale. At the same time our focus is to educate the village community especially the women in preventive health care, reduction in water borne diseases and adoption of good hygienic practices by the village community. Do let us know if you require further information. The strong involvemant of the community and the history of similar projects make this project quite likely to be successful. One would expect a project involving sanitation to follow.